The Environment Agency is reminding Boston residents to sign up for free flood warnings as it emerges its community work has been shortlisted for an award. The Agency has been nominated for a national award for its work to warn and inform Boston residents about the tidal surge and improve community resilience to flooding – but it is urging more people to sign up to reduce the impact of flooding on their homes, businesses, personal belongings and families. The 2013 tidal surge prompted people in Boston to take action by signing up to receive free flood warnings from the Environment Agency, reducing their risk from future flooding. Since the 5 December floods, the Agency has signed up over 1,250 people to flood warnings direct, completed more than 400 personal flood plans with residents, and held special events aimed at engaging foreign language-speaking communities. However, the Agency is quick to stress that many more people in Boston are still are not registered to receive free flood warnings. The tidal surge of December 2013 had a devastating impact on homes and businesses in Boston. Our teams worked around the clock to warn people in Boston in the period before the flooding and to help the community recover afterwards. While we are obviously proud to be nominated for an award, we are extremely aware of the distress flooding causes to communities – that’s why we’re still encouraging everyone in Boston and the surrounding communities to make sure they’re registered for free flood warnings and make a plan to make sure they know what to do should flooding happen again. 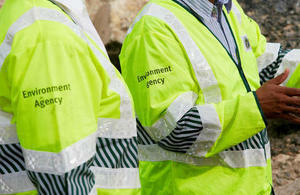 The Environment Agency has also been recognised for its work to raise awareness and support for the Boston Barrier. We’d also like to take this opportunity to thank all those people in Boston who have contacted us so far about the Boston Barrier or attended one of our drop-in sessions. The barrier is a vitally important project which will reduce the risk of flooding to 20,000 homes and businesses over the next 100 years and we encourage as many people as possible to find out more. The 2015 UK Public Sector Communications Awards has shortlisted the EA and seven other organisations for the Community Relations Campaign of the Year. The winner will be announced at a ceremony in London in July. People living and working in Boston can check whether they are signed up to receive free flood warnings by phone, text or email from the Environment Agency on the Flood Warnings Direct page or by calling Floodline on 0345 988 1188. To sign up for updates about the Boston Barrier or to ask any questions about the project, email Boston.Barrier@environment-agency.gov.uk or call 03708 506506.